Hello again my stamping friend! Wow, what a weekend! Have you ever had one of those, where you ‘to do’ list just goes out the window, with unexpected things coming up? Yup – that’s been my weekend! I don’t usually post on a Sunday, but I really wanted to join in the Watercooler Challenge this week, especially since they are also having a ‘Design Team Call’, for people interested in joining their Design Team. This week the challenge is ‘anything goes’, so I thought I’d try to work on a project that’s been in my head since seeing the Botanical Blooms bundle in the Occasions catalogue. Again, this project should have come together much more quickly than it did, but with interruptions….well, you know how it goes! This is the card front, with the Z folds closed. I started with a base of Whisper White cardstock, measuring 12″ x 6″. I scored it at 4″ and 8″, then measured up 1″ from either end, ending up with a piece cut on the diagonal measuring 5″ at the highest end (right side) and 1″ at the narrowest (left) end. I will be doing up a tutorial on how to create this fold, with pictures, so please check back in a couple of days for that! Next I cut my Crumb Cake cardstock pieces to fit the 3 panels, (front and back for the first 2 panels) swiped the inside of the Brick Wall Embossing Folder with Crumb Cake ink, then embossed all 3 panels. After attaching them with Tombow liquid glue, I stamped the hatched image stamp from the Botanical Blooms randomly on the panels, to add more texture. Then I started creating the flowers; I used a combination of the stamps and the coordinating Botanical Builder Framelits Dies – these are so fabulous!! I just love all of the shapes and sizes you can die cut, including some that don’t have matching stamps. For the leaves I stamped using combinations of Old Olive and Mossy Meadow inks onto Whisper White; the finer ferns were die cut from Pear Pizzazz cardstock. 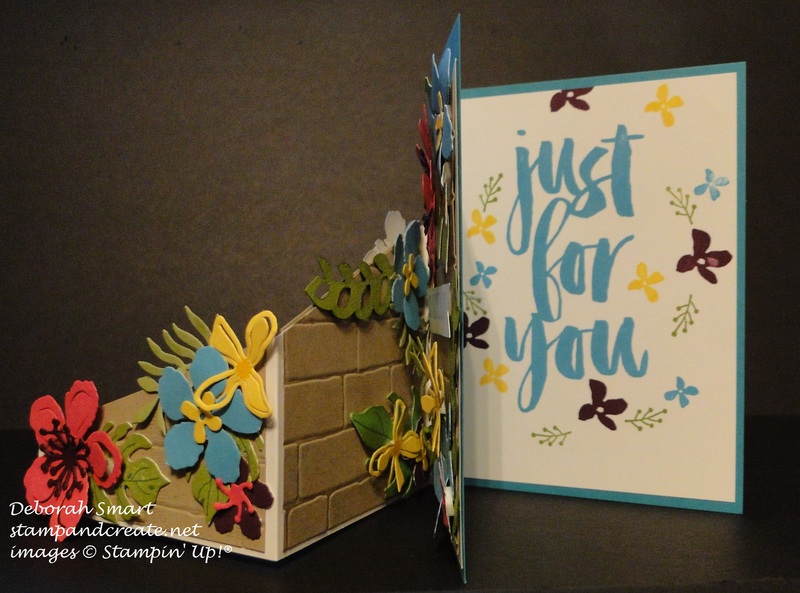 The flowers were stamped and die cut from combinations of Melon Mambo, Blackberry Bliss, Daffodil Delight and Tempting Turquoise cardstock and inks. I used the sentiment from the Botanicals For You free Sale-A-Bration set for the largest panel, stamped in Tempting Turquoise onto Whisper White cardstock. I stamped the large sentiment from Botanicals For You free Sale-A-Bration set, and added some of the small flowers from that set to the inside, in the same colours as the outside flowers; Blackberry Bliss, Daffodil Yellow and Tempting Turquoise, with Old Olive for the leaves. I swear, what sold me on this set was that happy doggy, hanging out the window! Okay, the whole set is cute, but really – this is exactly what our black Lab Shadow does! It’s just not a card ride, if he can’t hang his head out the window & sniff! I started by punching out some ‘clouds’ from Post-It Notes, using the Tree Builder punch, and stuck them onto a panel of Whisper White cardstock. I then sponged around the masked clouds using Pool Party ink with a Sponge Dauber. After removing the masks, I then stamped the car image in Archival Black ink, and added the balloons to the back, and the dog in the window (stamped in Soft Suede ink). I coloured the balloons using Blender Pens and inks in Real Red, Pool Party and Daffodil Delight, adding highlights with the Signo Gel White Ink Pen, and the Clear Wink of Stella Glitter Pen. The car was also coloured using the Blender Pens and inks; the tires in Archival Black, the spokes/rims and bumpers in Archival Basic Gray, the car itself in Real Red. I added the Clear Wink of Stella to the bumpers and window of the car, and the middle of the spokes. The sentiment is also from this Beautiful Ride set, stamped in Real Red onto Whisper White, and layered with banners in Real Red and Daffodil Delight cardstock. The banner ends were created using the Banner Triple Punch. To finish off the card, I sponged some Crumb Cake ink under the car, then added the Candy Dots in Pool Party and Real Red to the sentiment banner and the bottom right corner. 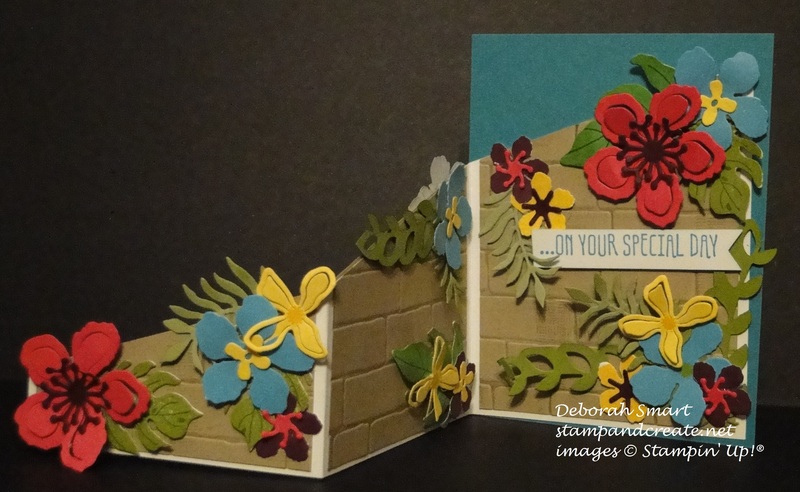 The whole stamped panel was attached the the Pool Party card base using Stampin’ Dimensionals. So, those are my two cards for the Watercooler Challenge WWC52, and their Design Team Call! I do hope you enjoyed seeing them; remember to come back in a couple of days, and I’ll have the tutorial on the Z fold card for you! Make sure you head to the Watercooler Challenge blog page, to see the great projects by the Design Team, and other cards submitted for the challenge. Previous Previous post: Picture Perfect! Wow, your z fold card is spectacular! Can’t wait for the tutorial. This card is just stunning! Your doggie card is so cute, too! Thanks for your kind words, Laura!! I’m so glad you liked my card. I’ll be working on taking the pictures for the step-by-step tutorial tomorrow. Thanks Deb for joining in the Watercooler Wednesday Challenge yet again. And also getting in on the Design Team call. I really love that type of Z fold card. Yours is fabulous. Lots of love…lots of work…lots of Big Shot! Nice combination of products from both SAB and Occasions too. I had fun setting myself a puzzle to suss out the items used without reading ahead. Thanks again for taking the time to leave a comment; I appreciate it! Well, Deb, I don’t know what happened to my comment, but it’s disappeared. So…second try. Well, Deb, your cards are wonderful but I’d expect no less from you. 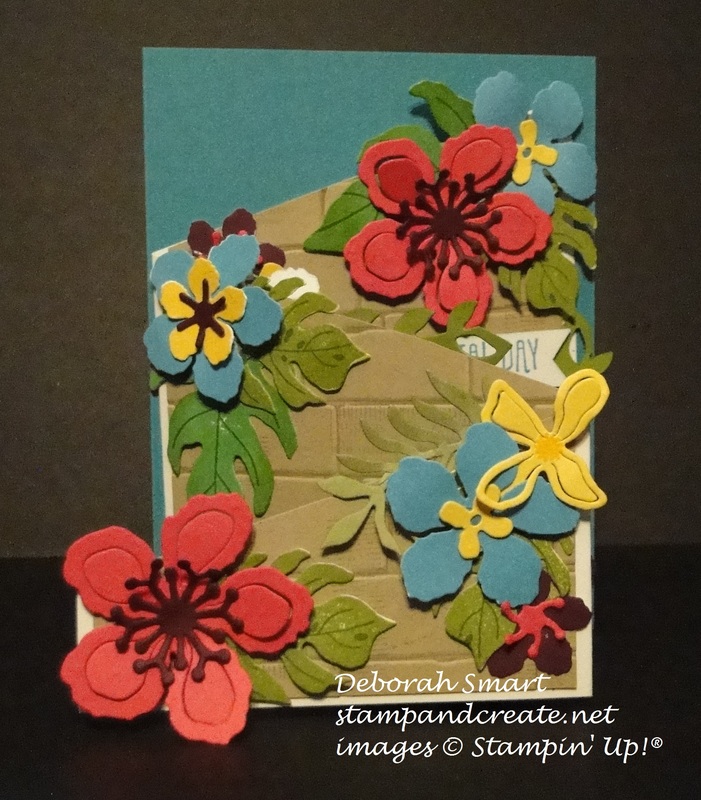 That first card, using the Botanical Blooms bundle along with the Brick embossing folder is a true “WOW” card. I like the way you’ve finished off that Z fold with a full base card. It certainly adds to the effect. 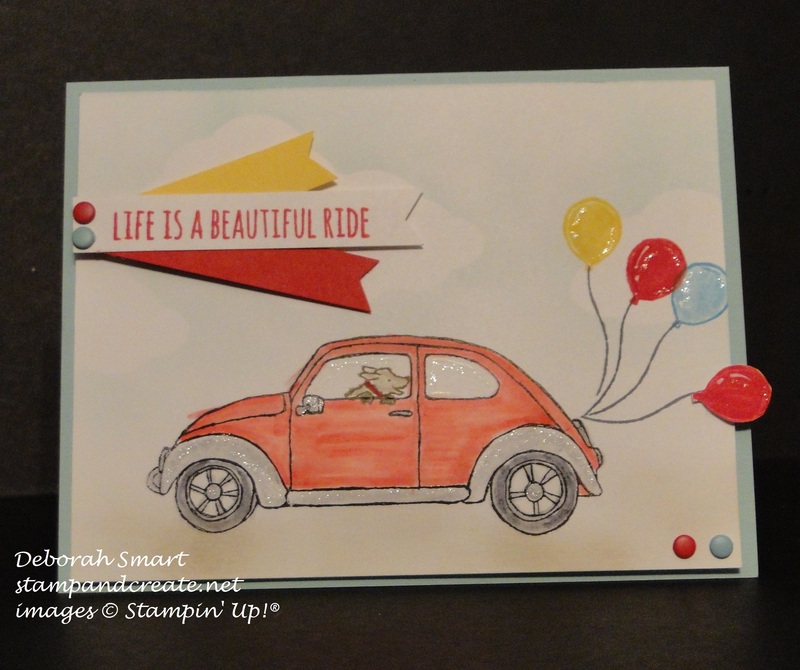 Who wouldn’t love the “punch buggy” card? That Beautiful Ride set is one of my favourites. My only question: should that dog be driving? Thanks so much for joining us this week for our Watercooler Wednesday Challenge. This is a beautifully detailed card that will make anyone’s day!